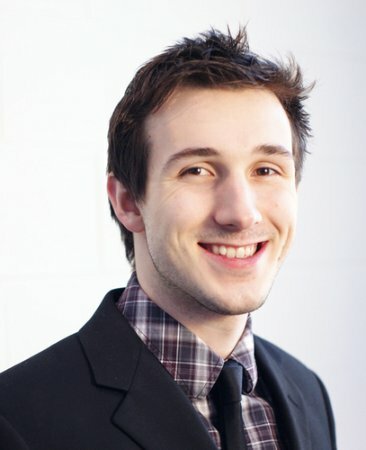 Geothink student Evan Hamilton recently defended his master’s thesis on Toronto data journalists’ use of open data. 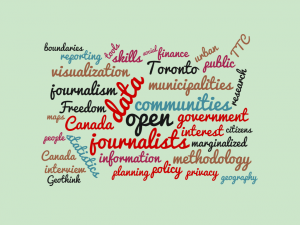 Data journalists are some of the most active users of government open data in Canada. In his recently defended thesis, Evan Hamilton, a master’s student in the University of Toronto’s Faculty of Information, examined the role of data journalists as advocates, users, and producers of open data. Are open data programs in Ontario municipalities developing in a way that encourages effective business and community development opportunities? How and why do journalists integrate open data in reporting? What are the major challenges journalists encounter in gaining access to government data at the municipal level? How does journalism shape the open data development at both the policy level and the grassroots level within a municipality? Legal provisions at various levels of government allow Canadians to make special Freedom of Information requests to try to access public information that is not readily available by other means. A nominal fee is usually charged. In Toronto, government agencies generally need to respond to such requests within 30 days. Even so, government responses do not always result in the provision of usable data, and if journalists request large quantities of information, departments have the right to extend the 30-day response time. For journalists, a delay of even a few days can kill a story. An issue of less concern to the journalists Hamilton consulted is privacy. The City’s open data policy stresses a balance between appropriate privacy protection mechanisms and the timely release of information of public value. Hamilton noted that in Toronto, the type of information currently shared as open data poses little risk to individuals’ privacy. At the same time, the journalists he spoke with tended to view potentially high-risk information such as crime data as information for which public interest should outweigh privacy concerns. While Hamilton concentrated on building a picture of journalists’ open data use in the City of Toronto, his findings resulted in several policy recommendations for government agencies more broadly. First, Hamilton stressed that “as a significant user group, journalists need to be consulted in a formal setting so that open data platforms can be better designed to target their specific needs.” This is necessary, according to Hamilton, in order to permit journalists to more effectively advocate on behalf of their local communities and those who may not have a voice. Evan Hamilton successfully defended his Master of Information thesis on September 29 at the Faculty of Information, University of Toronto. His work was supervised by Geothink co-applicant researcher Leslie Regan Shade, associate professor in the University of Toronto’s Faculty of Information. Other committee members included University of Toronto’s Brett Caraway and Alan Galey (chair), as well as April Lindgren, an associate professor at Ryerson University’s School of Journalism and founding director of the Ryerson Journalism Research Centre, a Geothink partner organization. This thesis describes how open data and journalism have intersected within the Canadian context in a push for openness and transparency in government collected and produced data. Through a series of semi-structured interviews with Toronto-based data journalists, this thesis investigates how journalists use open data within the news production process, view themselves as open data advocates within the larger open data movement, and use data-driven journalism in an attempt to increase digital literacy and civic engagement within local communities. It will evaluate the challenges that journalists face in gathering government data through open data programs, and highlight the potential social and political pitfalls for the open data movement within Canada. The thesis concludes with policy recommendations to increase access to government held information and to promote the role of data journalism in a civic building capacity. Reference: Hamilton, Evan. (2015). 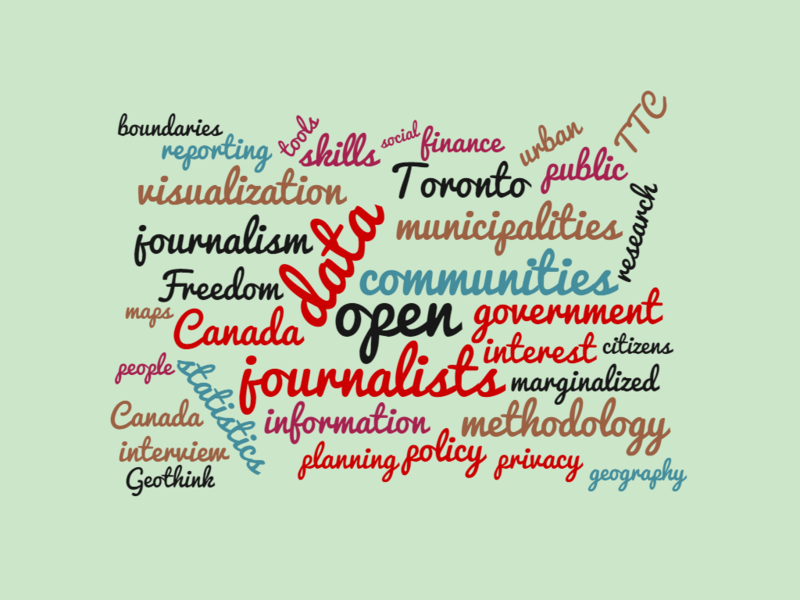 Open for reporting: An exploration of open data and journalism in Canada (MI thesis). University of Toronto. This entry was posted in Refereed Publications & Conferences and tagged April Lindgren, City of Toronto, journalism, Leslie Regan Shade, open data, Research Theme 4: Open Everything, Ryerson Journalism Research Centre, thesis, University of Toronto on November 9, 2015 by Geothink.